To Make Chicken Tikka Masala (Serves 2)1. Heat 2 tbsp oil in medium saucepan.2. Add 1 medium diced onion; fry until the onions are soft.3. 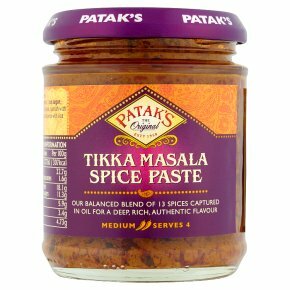 Add 1/2 jar of Patak's Tikka Masala Paste, 100ml of water, 1/2 tsp each of finely chopped ginger and garlic (optional). Cook until reduced and thickened, stirring occasionally.4. Add 250g diced chicken breast, fry until sealed.5. Add 100ml water, 200g canned chopped tomatoes, bring to the boil, simmer un-covered for 10 minutes.6. Add 100ml double cream, 1 tsp of sugar, simmer un-covered for 5 minutes.Garnish with fresh chopped coriander.To Marinade: Use paste on its own or blended 50:50 with natural yogurt. Marinate meat then bake, grill or BBQ.This product must be cookedStir well before use.